This is an in-situ photograph of the chest and abdominal contents. 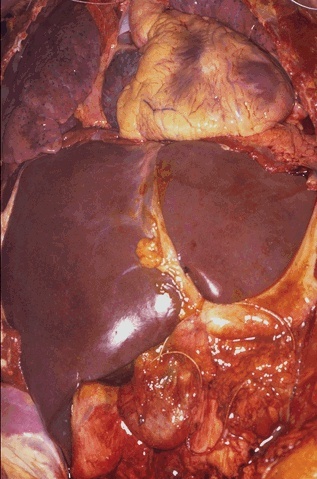 As can be seen, the liver is the largest parenchymal organ, lying just below the diaphragm. The right lobe (at the left in the photograph) is larger than the left lobe. The falciform ligament is the rough dividing line between the two lobes.